I just returned from spending six weeks in Tanzania, and I'm still in shock. 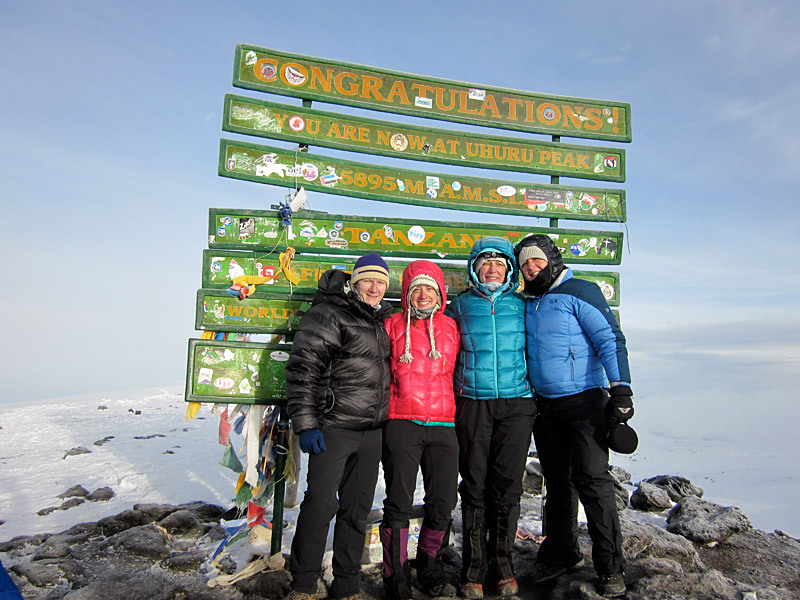 Over that month and a half I had the great pleasure of helping 31 individuals stand on the Roof of Africa (over the course of three summit climbs) and also to go on three safaris in Serengeti National Park. In short, the trips where nothing short of amazing. The adventure of climbing a nearly 20,000-foot mountain followed by the sheer volume of animals we see on safari can't truly be captured in a post, but I'll try to scratch the surface. 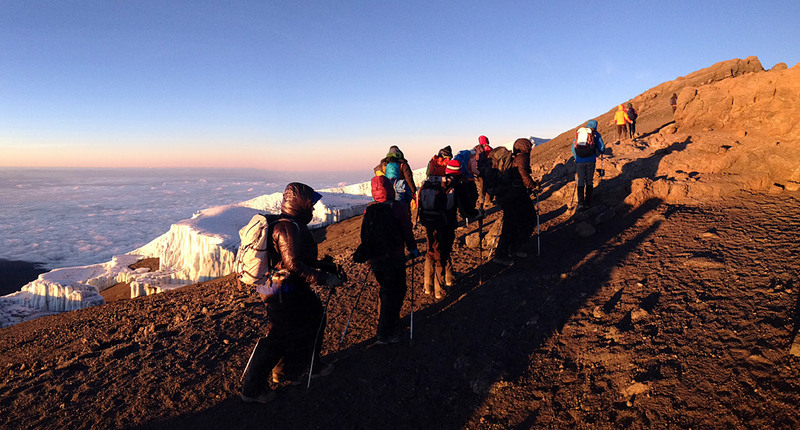 Anyone that says climbing Kilimanjaro is easy, either hasn't done it or is looking for an ego boost. It's not easy. Sure, it's not technically demanding but it is close to 20,000 feet, and I can assure you the air is thin up there! 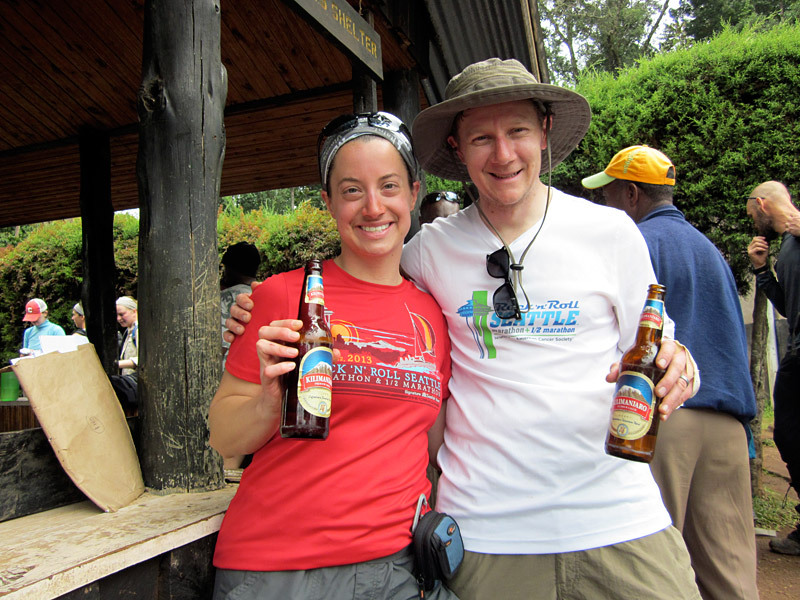 Climbing Kilimanjaro is hard work. There is no denying that. 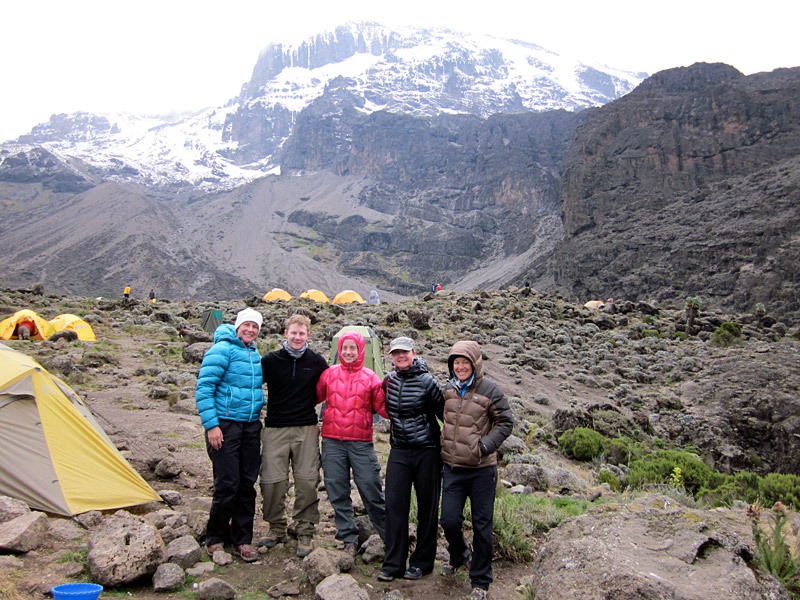 Anyone that says climbing Kilimanjaro is easy, either hasn't done it or is looking for an ego boost. It's not easy. Sure, it's not technically demanding but it is close to 20,000 feet, and I can assure you the air is thin up there! Yes it's hard work, but it also very doable for anyone in good shape and with the required mental toughness. It's true, some people experience signs of AMS (Acute Mountain Sickness) on summit day, or before, but being in good physical condition beforehand and listening to your guide during the climb will help reduce those chances as much as possible. And if you do develop a little headache high on the mountain, I can assure you it will go away after you start descending. And it's more than worth it. 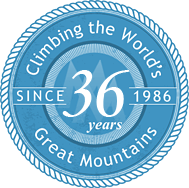 Just ask any of our 31 clients who just stood on the summit. 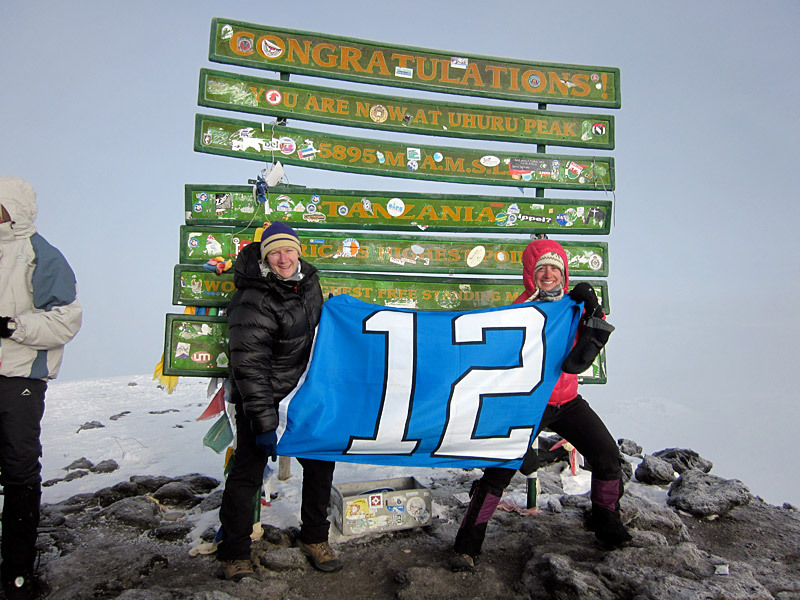 There simply is no comparison to the experience of standing on the highest point in Africa. After landing in Moshi, Tanzania the evening of the first night, people usually sleep pretty soundly at the comfortable K's Lodge out of which we base the climb. If you are lucky enough you might get a glimpse of the mountain from the upstairs balcony of K's if the morning is clear. But this is the equator and clouds are common place even in the cool, dry season. Speaking of "cool," that was something I wasn't expecting. The weather in Moshi, at roughly 2700', was quite comfortable. I was expecting heat and humidity but what I experienced was often cloudy and coolish weather. Not blazing hot sun. After a good night's sleep  hopefully overcoming some jet lag  and a filling breakfast, the first day in Africa is spent relaxing, going through our gear and visiting the town of Moshi. 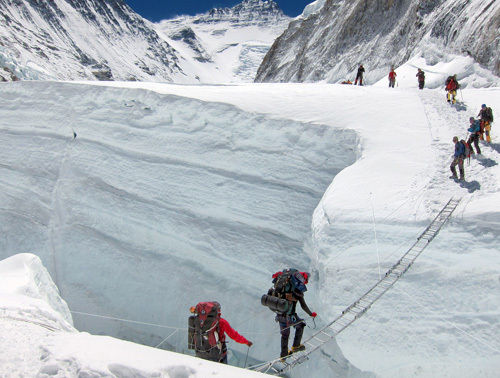 Once all our gear is sorted and packed we have a good dinner and talk the details of the climb. Then another night to catch up on sleep before the big first day. After breakfast we load up in a small bus for the ~45 minute drive up to the Machame Gate and the official starting place of our climb. We have some down time at the gate while all of our gear and staff get sorted for our expedition. But then we are off. Day one of the climb is a good one. Just a walk in the rain forest. We walk through the forest for about five hours steadily gaining 4,000 feet of elevation gain but never ascending too steeply. 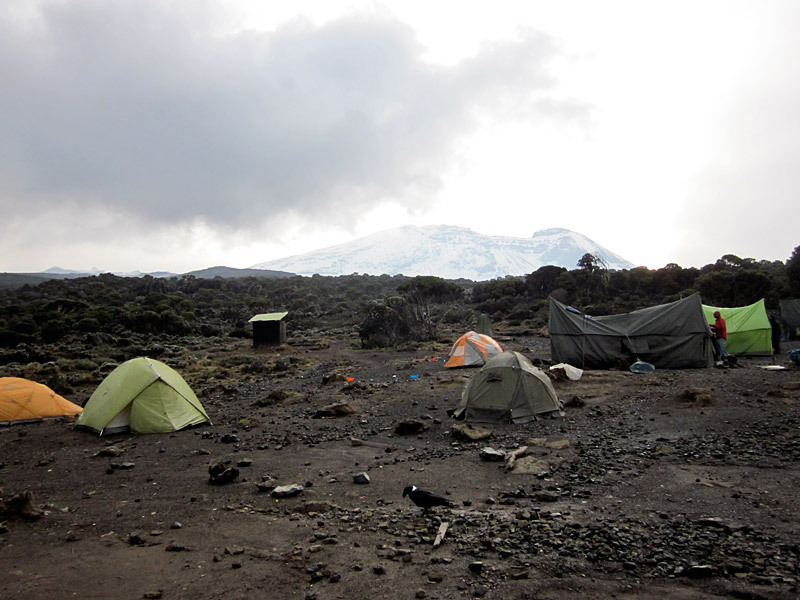 Our first camp, Machame Camp, is in the forest but views of Kili are common either late in the evening or in the morning. 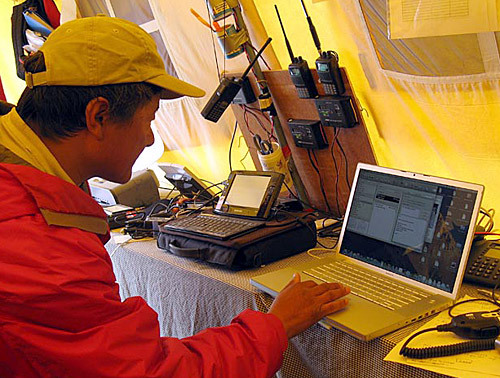 There is a very communal feeling in the camps with many expeditions all working towards the same goal. 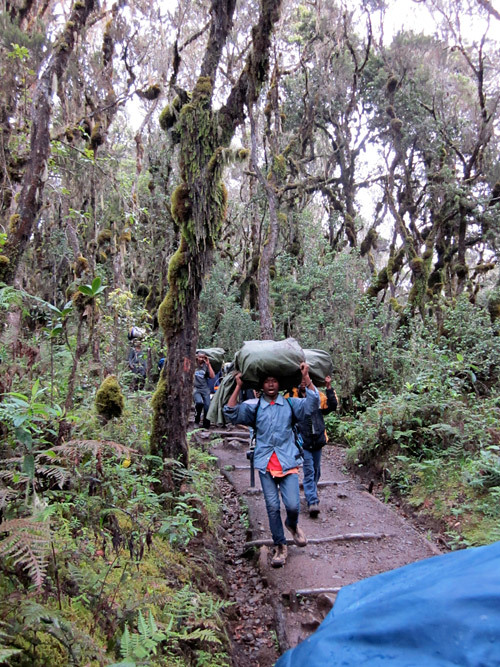 Day two of the climb is shorter but steep and moderately strenuous as the trail climbs up to the Shira Plateau often on rock or steep trail. But it's one of my favorite days as the trail is interesting and the views great. We also see some really cool plants! Camp two, Shira Camp, is a special one. Sometimes windy, but always a great view. Mt. 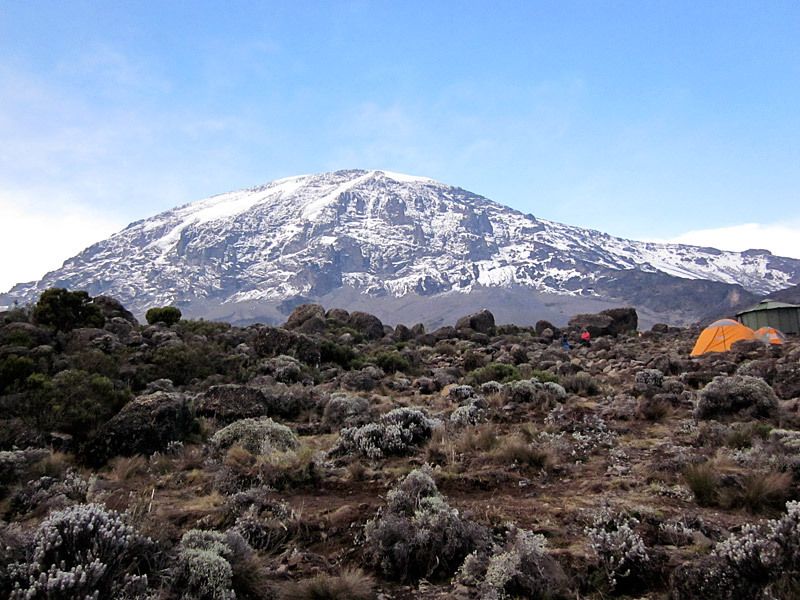 Meru, Shira Ridge and Kili surround the open camp. Its a great place to spend the afternoon relaxing and of course hydrating!! Day three is a longer one, but the trail is nice and gradual, not rocky and not steep. 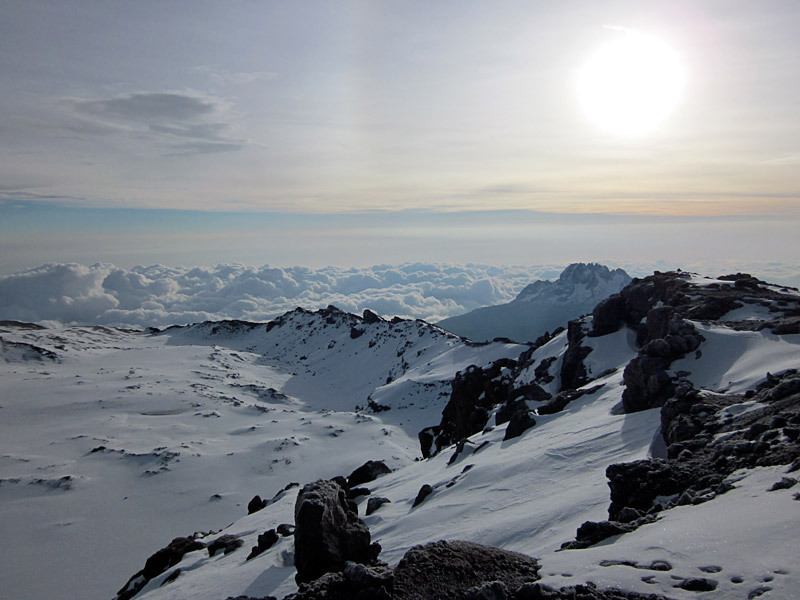 Views are amazing as we stare straight at the south side of Kili all day long. We get up closer to the glaciers and have a good look at it. 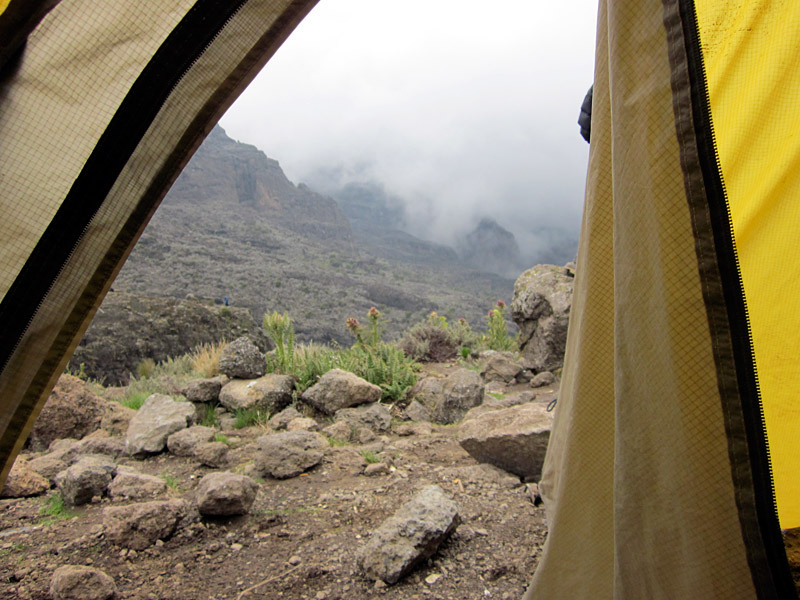 We climb up to over 15,000 feet at Lava Tower before dropping back down to one of my favorite campsites, Barranco Camp. 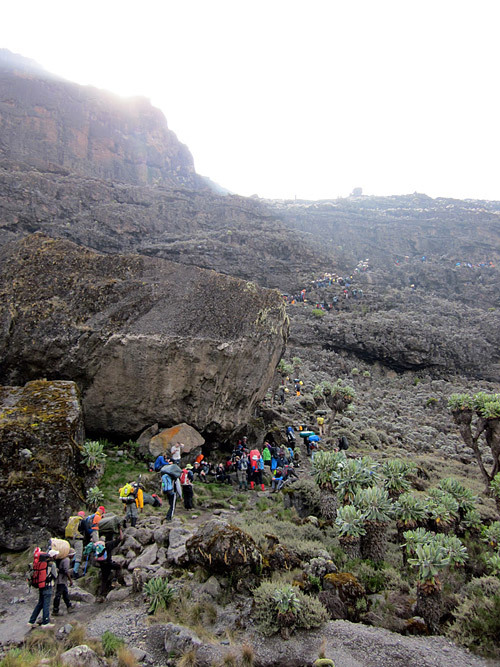 Barranco camp is in a protected little valley and you can see the path winding up the Barranco Wall  our task for the following day. Day four is a shorter one. We get down to business right away. 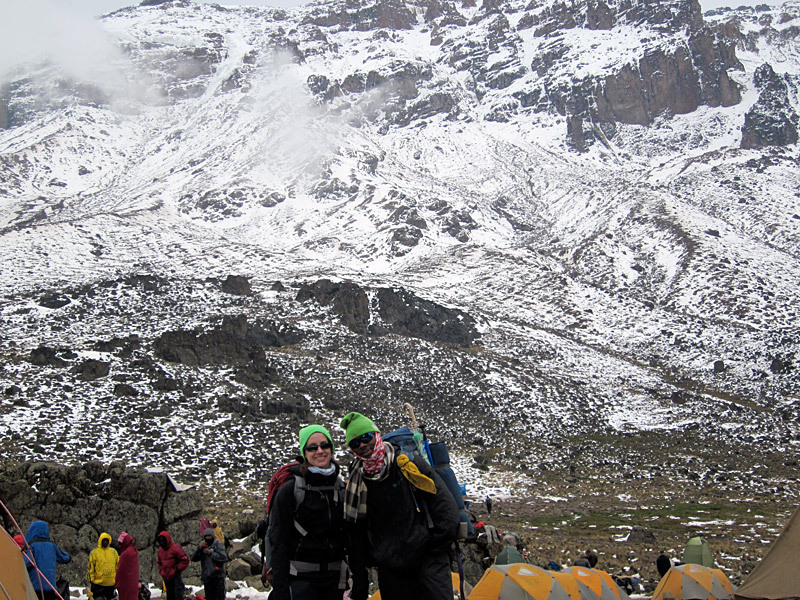 The first hour and a half of the day is spent hiking and scrambling our way to the top of Barranco Wall at around 14,000 feet. The trail is good and the rock is solid with good hand and foot placements for the several places where using your hands are required. 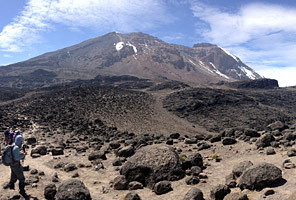 But the scrambling is easy, there is no exposure, and it's actually not nearly as bad as it looks from Barranco Camp. 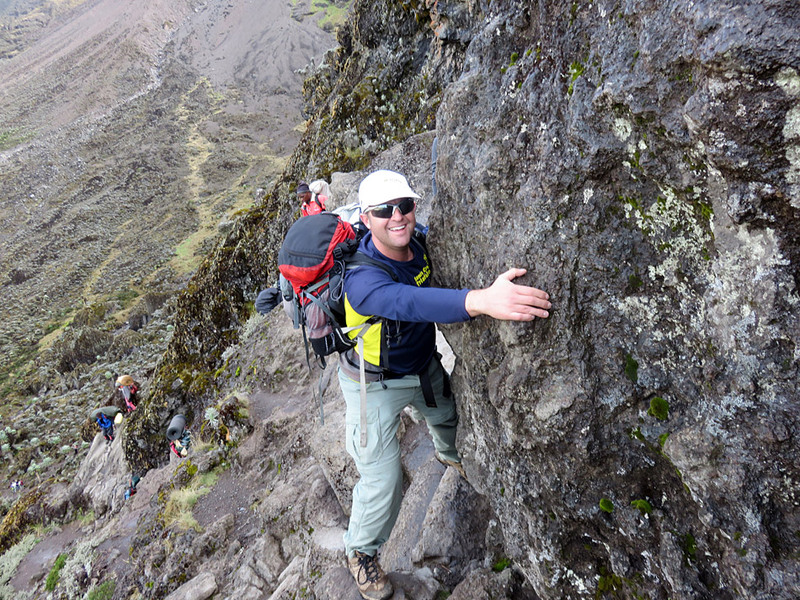 All of my teams said the Barranco Wall was one of the highlights of the climb. 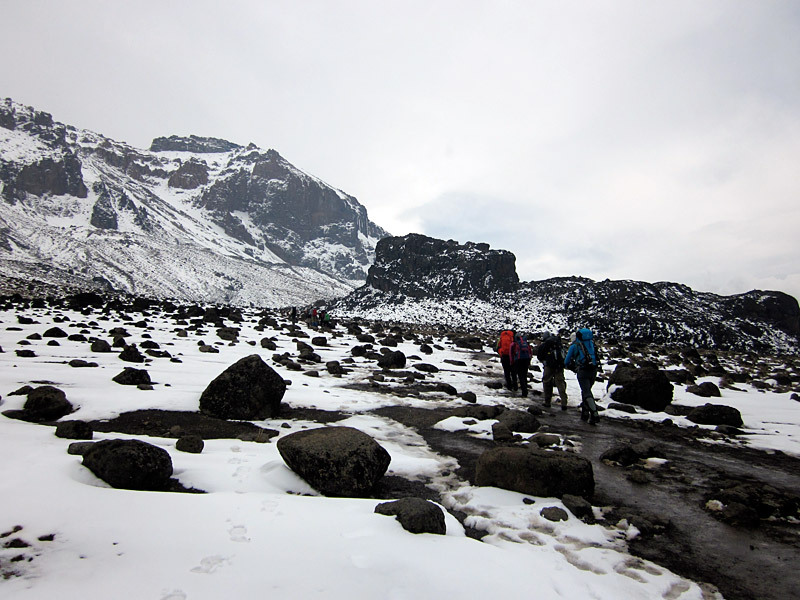 Once at the top of Barranco Wall the trail then crosses three little valleys before arriving at Karanga Camp on a ridge. This is another wonderful place to camp, and we enjoying a hot lunch in camp after about four hours of hiking. Day five is one of the shortest days. 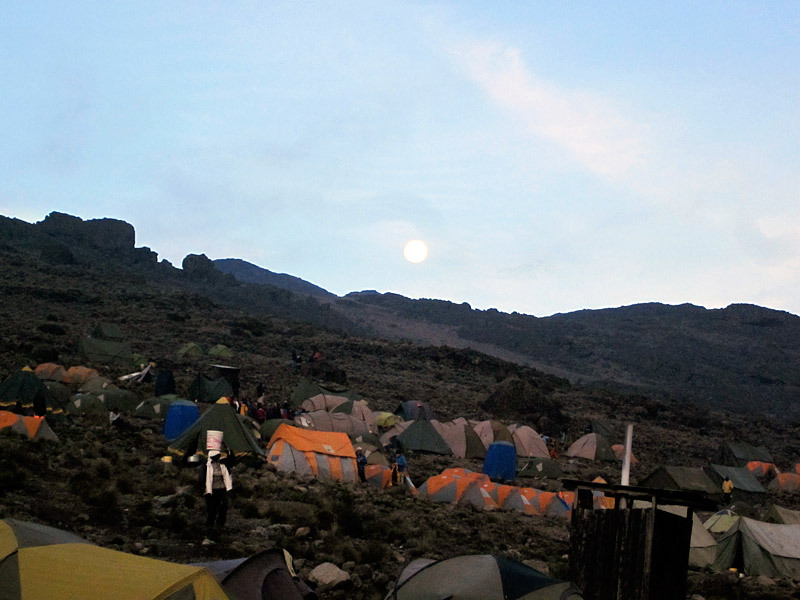 A good, moderate trail climbs 2,000 feet up to Barafu Camp, our high camp at around 15,200 feet. 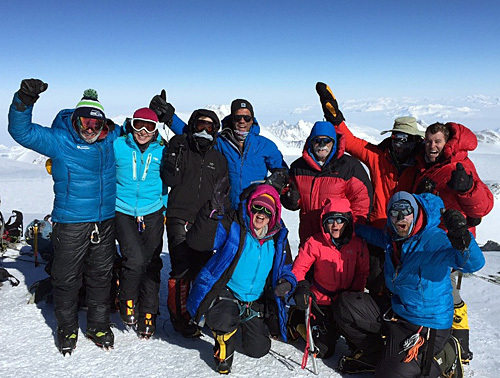 Views are phenomenal and spirits run high as the summit climb is near. Hot lunch at camp, then everyone packs up for the big night and then an early dinner before hitting the tents early for a few hours of rest. Often sleep is difficult to find in the early evening, but not to worry as long as you are laying down resting that is all your body needs. You'll sleep tomorrow night, guaranteed. Day six we wake up before midnight for a quick breakfast and hot drinks before heading up into the night. Yes, it is cold, but we have the proper gear, and it's not unbearable. 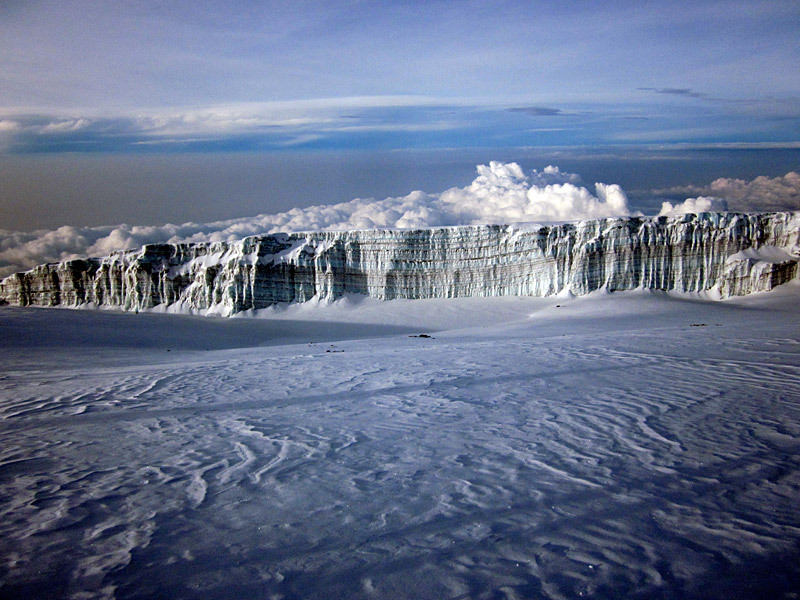 Kili is not generally a windy mountain so that helps, but we can experience any type of weather on a big mountain like this. 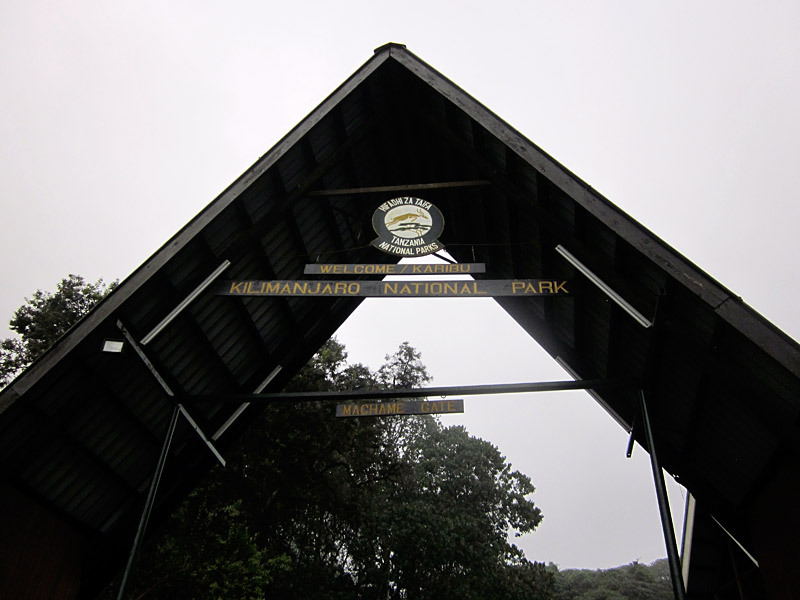 It generally takes around seven hours to hike up to Stella Point where the route meets the crater rim of Kilimanjaro. The trail is steep, but the footing is good, and it's just hiking  no hands necessary. The stars are out and it's so peaceful as you find your rhythm. Pressure breath, rest step. Repeat. Once at Stealla Point, the trail kicks back in grade for the last 500 feet up to Uhuru Peak which takes about an hour. 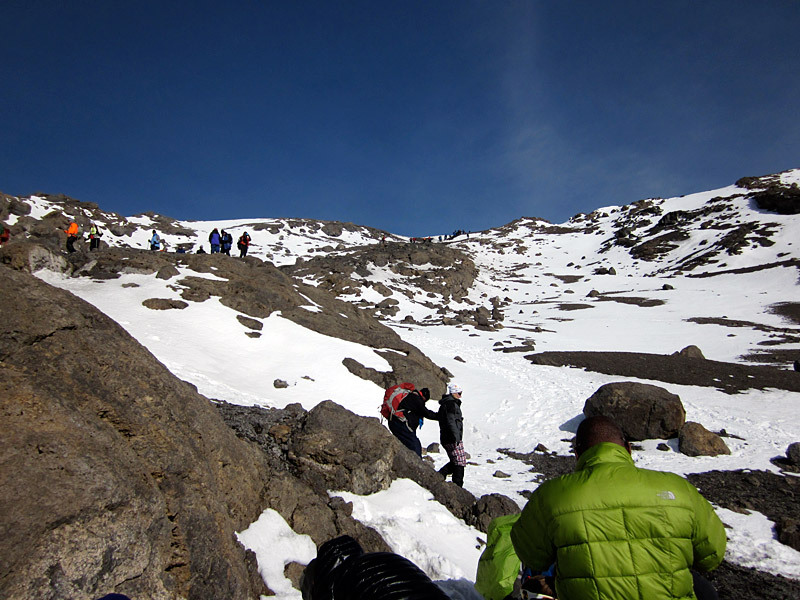 We pass many glacial remnants as we walk along the crater rim on good, gradual trail. 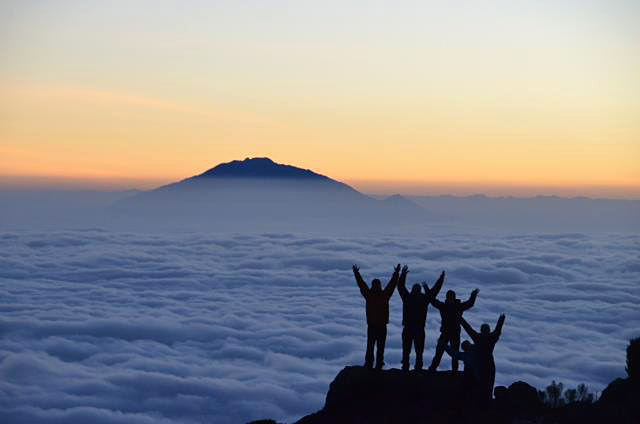 Once at Uhuru Peak, the true summit of Kilimanjaro at 19,341 feet, the sun is up, and it starts to warm us up which is always a good feeling. Spirits are at an all time high. We are on the Roof of Africa. Pictures, hugs and tears of joy. 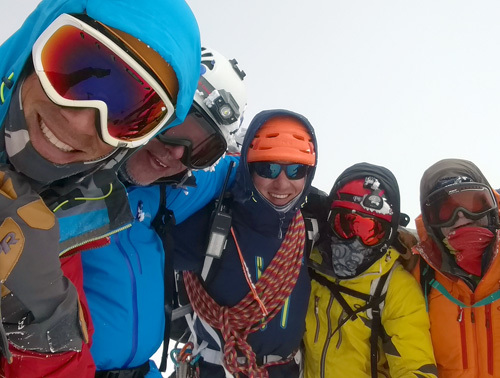 Whether we are alone on the summit or sharing it with several others, the feeling and summit are unique. After we are done taking photos and celebrating, it's time for the long walk down. We are only halfway done after all! 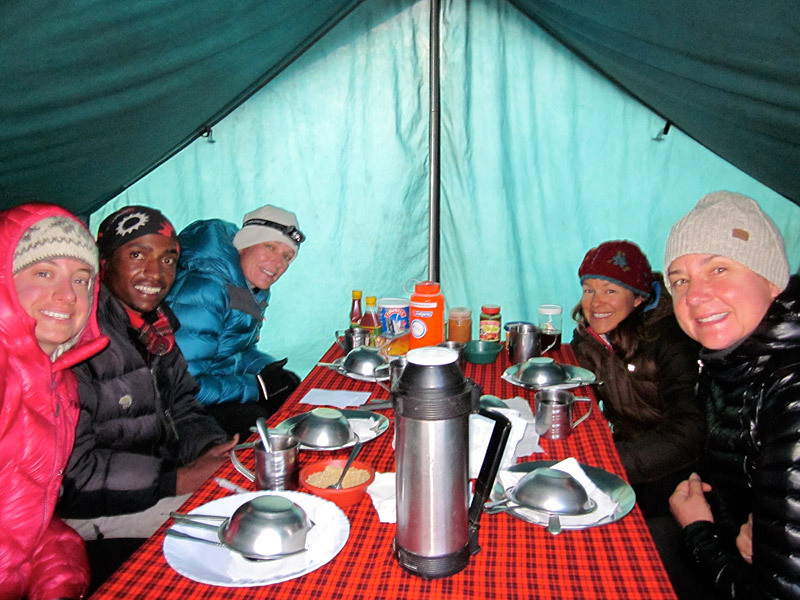 But before you know it, we are back down at Barafu Camp enjoying a well deserved hot lunch after about a 3-4 hour descent. After lunch we pack up our stuff and continue heading down to Mweka Camp. 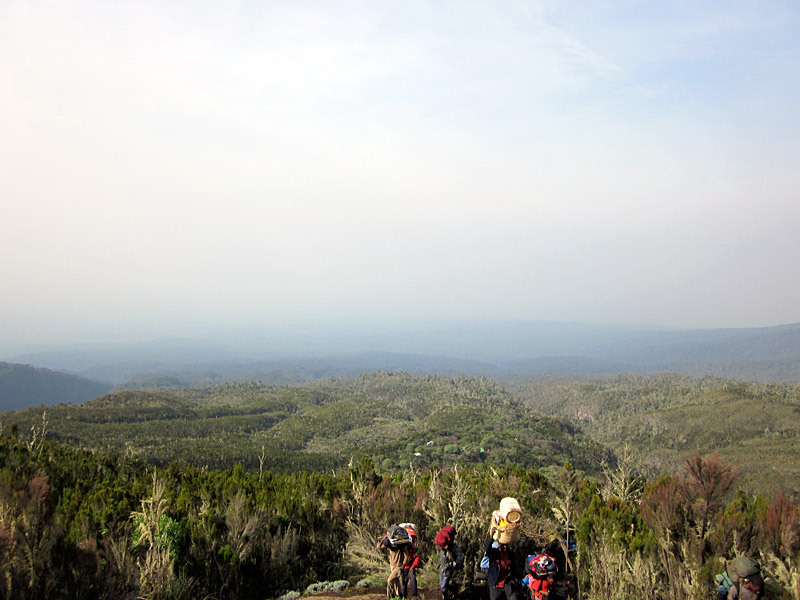 It's about four hours from Barafu to Mweka, but every step we descend the better we feel as we start breathing the thicker air. It's a long, hard day: first climbing 4,000 feet and then descending 9,000 feet but the feeling of accomplishment takes your mind off the descent. 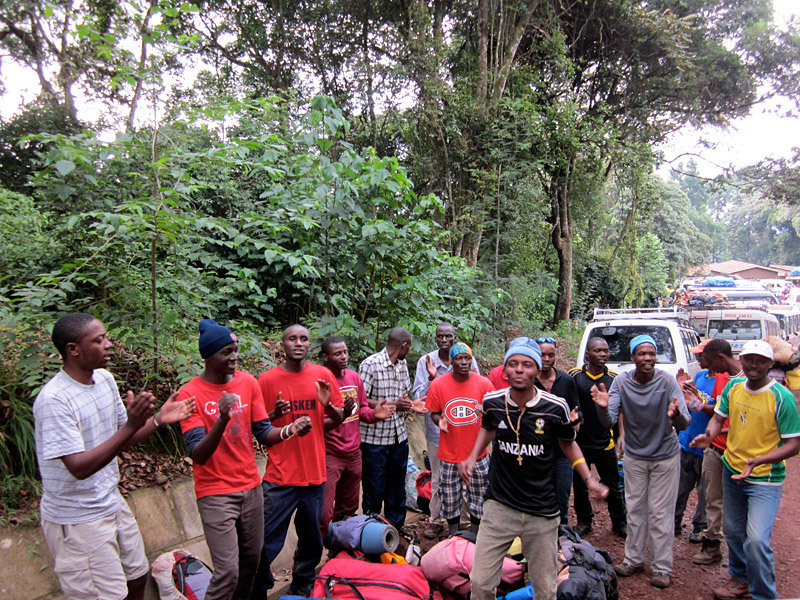 The vibe at Mweka Camp at 10,000 feet back down in the forest is mixed. Everyone is super excited and happy but also really tired after a 16+ hour day. It's a wonderful place to camp with shade, a bit of wetness to the air after some dusty camps, and thicker air! An early dinner is in order followed by the best night's sleep since landing in Africa! Really!! 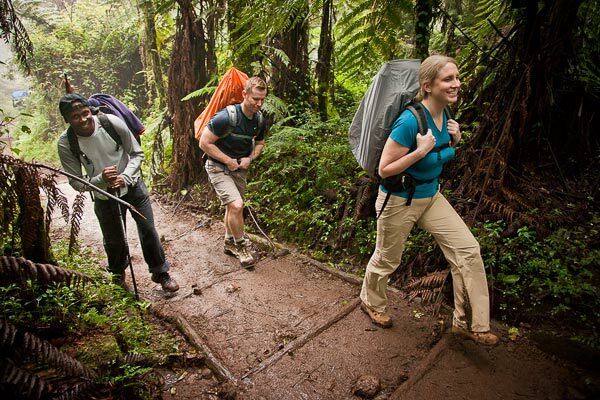 Day seven is a short day as we finish off this part of the adventure with a 3-hour hike down a good trail to Mweka Gate and the official end of the climb. We have a little ceremony where the staff sings us the Kilimanjaro song and then we get to tip all our staff for their incredibly hard work. These guys are simply amazing and the trip would not have happened without them. Then we load up in the bus and head back to Moshi. Showers, lunch and packing up for the Safari is how we spend the afternoon prior to our celebratory dinner which our Chagga Guides attend to celebrate with us. A great communal dinner where we feel rested and recount stories of the climb. At dinner we get to tip our Chagga guides for their hard work, and everyone is in good spirits. 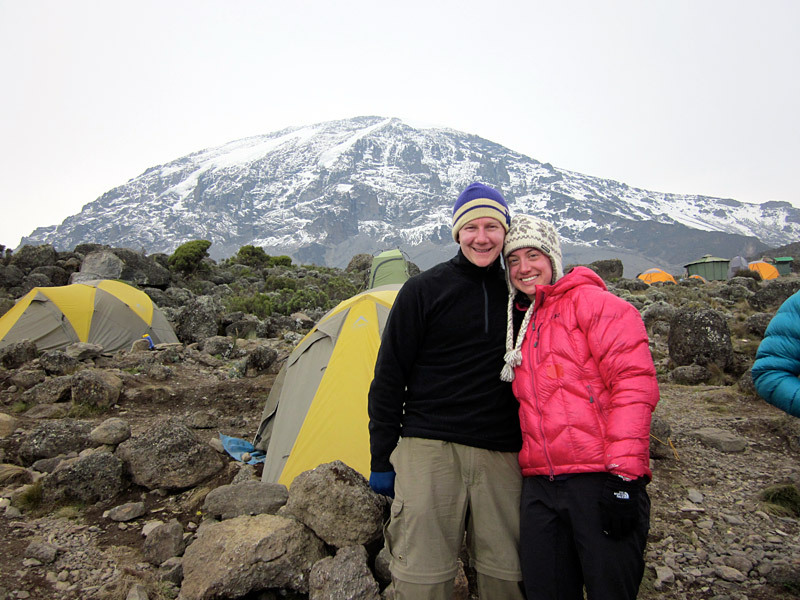 We just climbed Kilimanjaro and tomorrow we leave for a Safari! Can't think of a better reason to celebrate!! The following morning we take our private little bus to Arusha where we leave all of our climbing gear at the head quarters of the Safari operator. 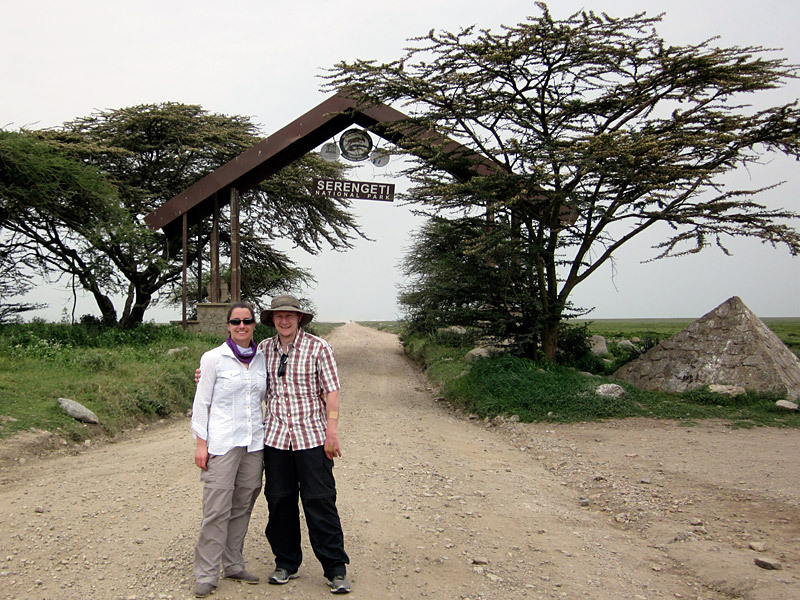 Then we head to the small Arusha airport for our 1pm flight to the Seronera region of Serengeti National Park. This is where things get even better. Our 1-hour flight typically culminates with some wildlife spotting on the approach to the landing strip. 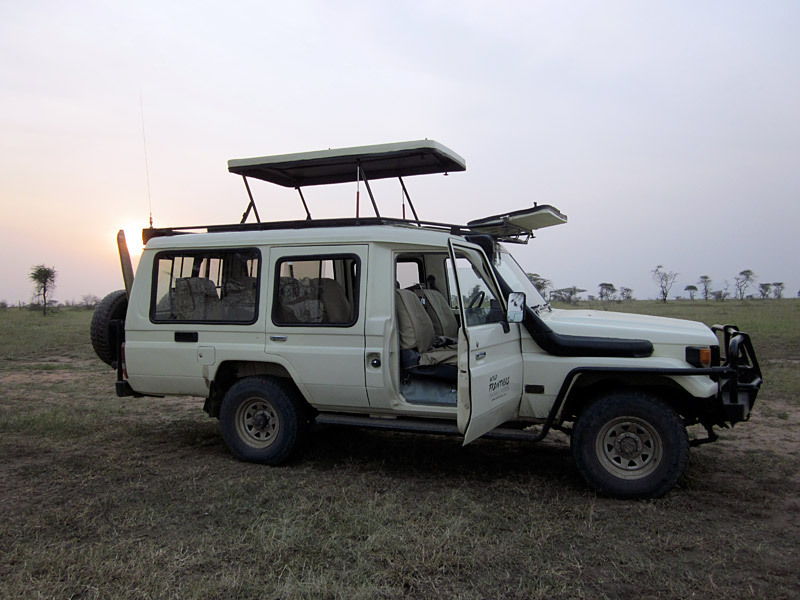 Once on the ground, our safari guides are there to greet us, and we load up in very comfortable extended Toyota Land Cruisers with pop-up roofs. I can't think of a better vehicle or setup for watching wildlife. 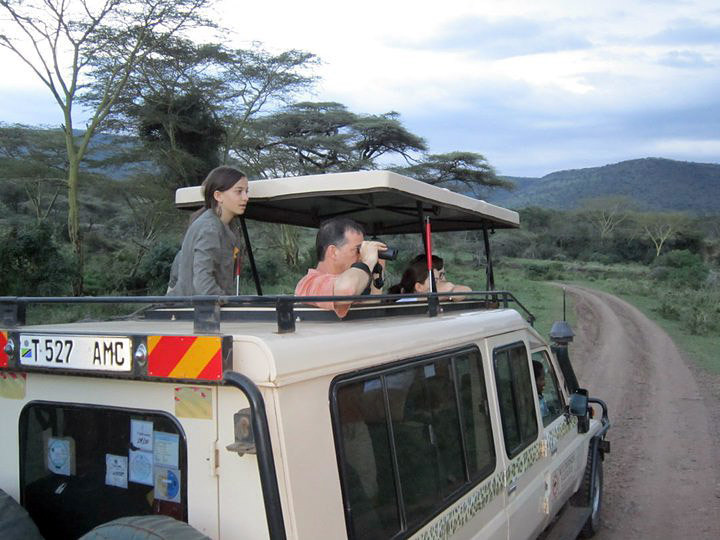 You are free to stand up and look out at the Serengeti as we look for wildlife. I could spend many thousands of words trying to describe the wildlife and still not do it justice. Suffice it to say the wildlife is close and plentiful. Everyone always talks about seeing the Big 5  lions, leopards, elepants, rhinos and buffaloes. While we typically see all those over the course of the safari, those animals are just the tip of the iceberg. Giraffes, zebras, hippos, hyenas, gazelles, antelopes of all sizes, warthogs, cheetahs and birds upon birds don't even start the list of animals we see. Simply amazing. 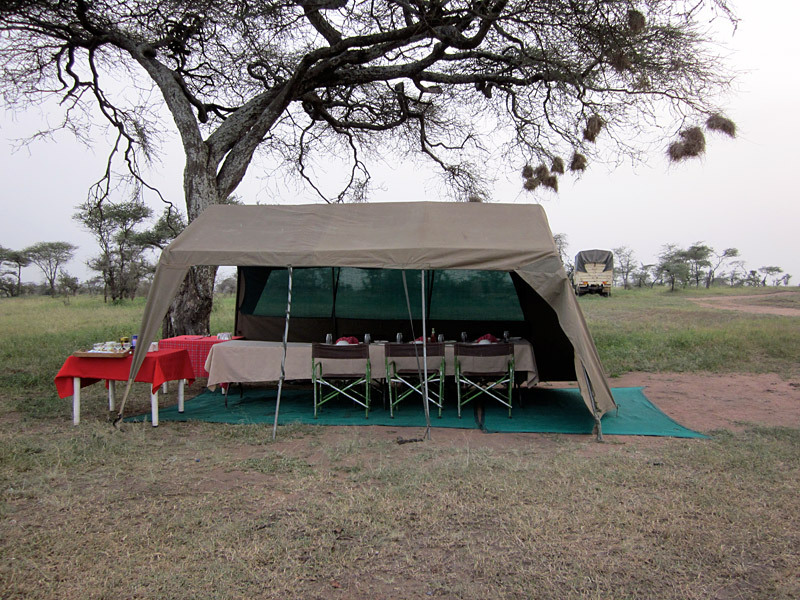 After our afternoon game drive, we head to the very well appointed Serengeti Wilderness Camp for the night. To call this 'glamping' is an understatement. 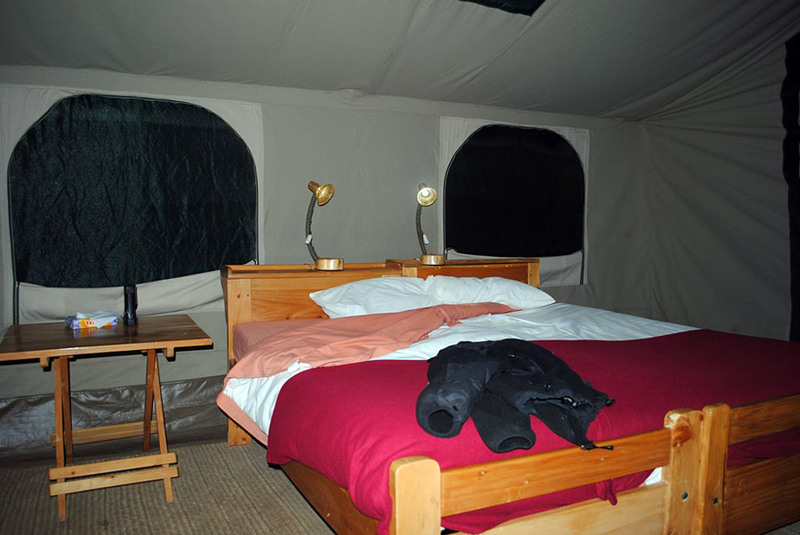 Comfortable, warm beds and a full bathroom with sink, shower and flush toilets await guests in each "tent". Really the resemblance to tents ends at the zippered front door. 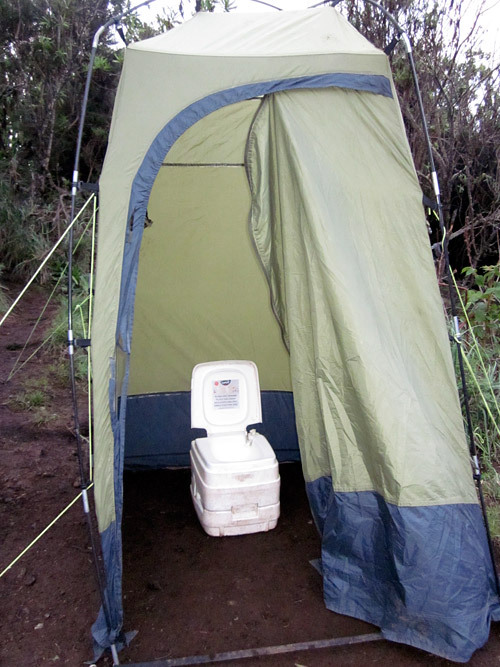 It's very comfortable and definitely not roughing it. And I should mention the food.... 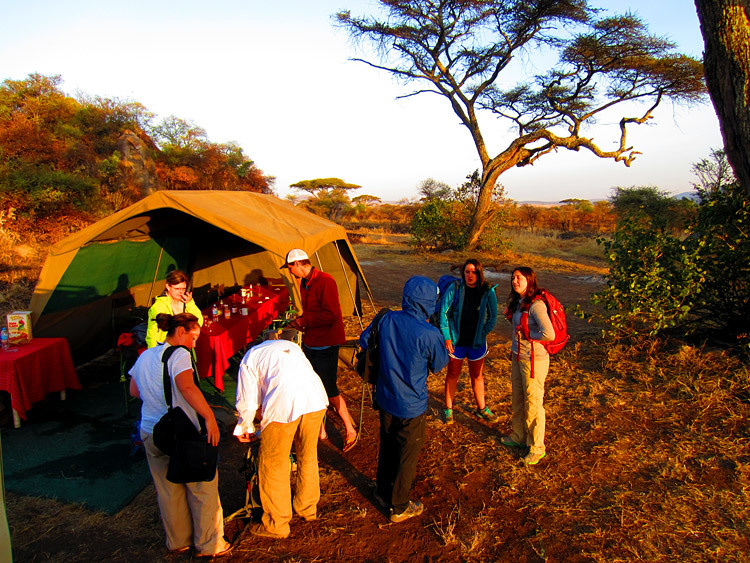 The best food we have in Africa is prepared for us on the Serengeti. It's an amazing place to spend a couple of nights falling asleep to the sounds of zebras barking outside your tent. I really wouldn't pass this up for anything. The next morning we wake up early as that is when the wildlife is active. A delicious filling breakfast and we are off to wake up with the animals. After a game drive of several hours we head back to camp for a fantastic lunch and little afternoon nap during the heat of the day when the animals are the least active. Then it's another afternoon game drive. The option of an early morning hot air balloon ride exists and from everything I heard, it is absolutely amazing. So that is always an option to explore with each group as well. Another blissful night in camp and we are up early again for a long day of game viewing. I love waking up early in the camps and watching the sunrise over the Serengeti from the front porch of my "tent". 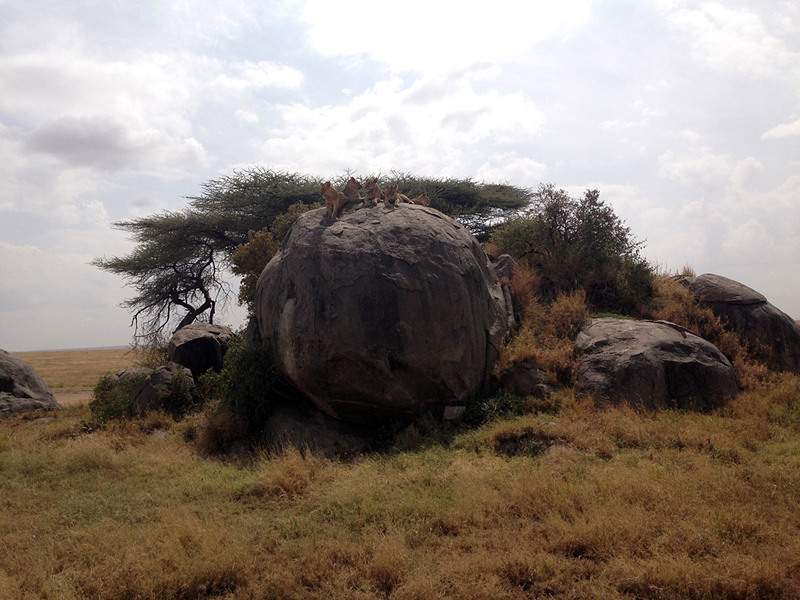 We leave the Serengeti mid morning and make our way to Oldupai Gorge and Museum. A really interesting place where anthropologists think Homo Sapien Sapiens first evolved. After a visit to the museum we make our way to Ngorongora Crater passing Maasai people and their traditional villages enroute. "The Crater" is a very interesting geological formation full of wildlife, springs, lakes, forests, hills and grasslands. A high concentration of wildlife calls Ngorongora Crater their home and its here that is our best chance of seeing the endangered Black Rhinos. After an afternoon exploring the crater floor and seeing its residents we depart for the hour long drive up out of the Crater and to our accommodations for our last night. The safari lodge will blow you away. Exotic, natural and extremely comfortable it is the perfect place to spend our last night of our trip and refresh before the trip ends. And of course to talk about all the animals we just encountered!! The food here rivals the food at the Wilderness Camp. 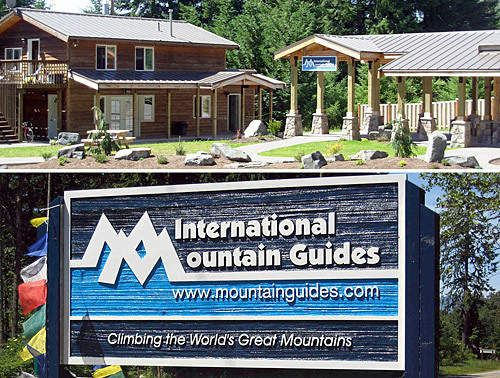 The following morning is typically a relaxing one and these lodges are the perfect place to do just that. After lunch we make our way back towards Arusha stopping at shops along they way to pick up those African souvenirs. We pick up the rest of our luggage in Arusha, repack and then head to the airport for flights home with memories and pictures to tell our friends and family about. An added bonus was the lack of the usual crowds in the Serengeti. Tanzania is one of the safest, if not the safest country, in Africa. And its no where near any of the Ebola infected countries. But due to fear inducing media coverage in western countries the usual crowds aren't there. Bad for Tanzanians, good for the those tourists who do go!! 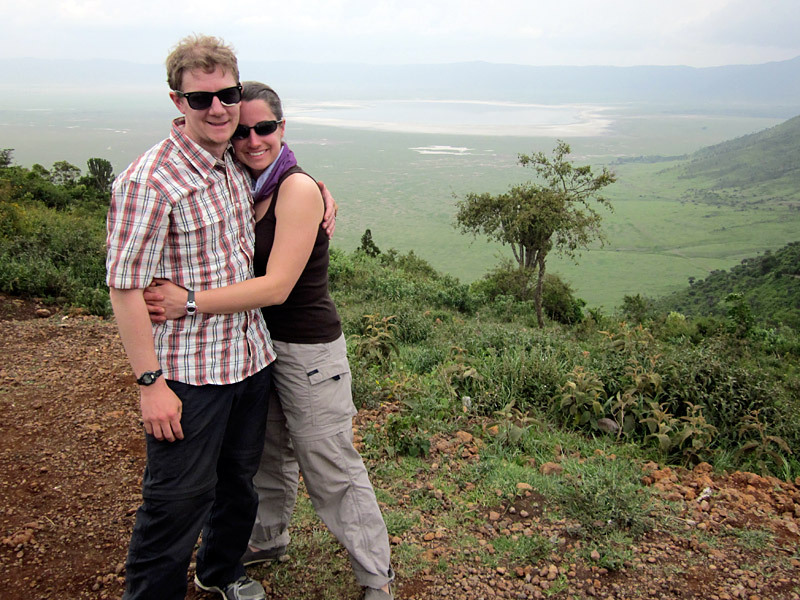 A Kilimanjaro climb and Serengeti Safari are truly the trip of a lifetime. I was lucky enough to guide 3 such trips  all very successful  and can't wait to return in February! 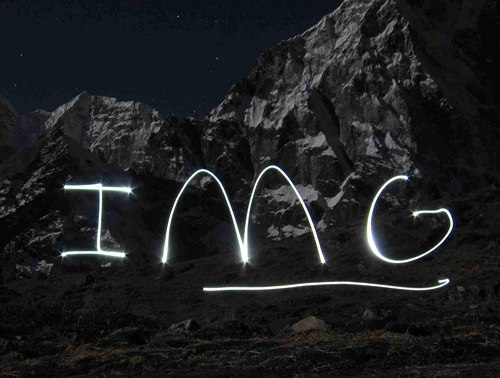 I hope you can join me this winter in Tanzania on this amazing trip or on a future trip with IMG. I promise you won't regret it!